Called Ye Ole butcher on Monday. Curing meats this weekend! The local butcher butchers hogs on Tuesday's so I called Monday to reserve a couple bellies and jowls. The store front doesn't open until Thursday so today I stopped by to pick up my order. Jowls were exceptionally nice this time being really meaty and plump weighting about 1 pound each after trimming glands and white stringy fat. One belly is getting cured for pancetta the other will I'm thinking its time for another Black Forrest Maple Bacon. The jowl....those lovely jowls are getting cured into ghost pepper guanciale. Re: Called Ye Ole butcher on Monday. Curing meats this weekend! In about 6 weeks it'll be traditional pasta carbonara time and not the Americano version with ham chunks and heavy cream sauce. 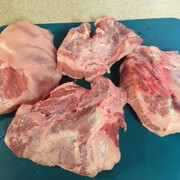 One of the things we did was cut the Jowls (we call them cheeks) from the pigs head before making guanciale. Perazz...You are the king of meats around here. Keep posting. Someday, I'll check back and use these posts as references to make similar attempts. And next week I'll start my annual Christmas Chile Verde deal which I've posted here. He's in the very top tier, but after Mayor of BBQ's "porchetta" post of 1/30/2017, I'd have to be a judge at a "Smoke-Off" to know for sure ... !! LowRyder, Thank you! I hope to inspire others here to take up the delicious hobby and lost art of home curing. 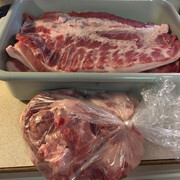 Lannis I can hold my own on low and slow cooks like brisket, ribs and/or pulled pork. Interestingly enough as much as I love to make L&S BBQ I rather eat a peanut butter and jelly. Traditional curing and air drying of meats is a different kettle of fish verses BBQ. Each is a seperate art form and each have their own rewards. Actually they both have the exact same reward. Watching the smile on folks faces as they enjoy what you have prepared. If this is what kitchens in heaven are comprised of I better stop sinning. Bev makes great Spaghetti Carbonara, It's my favorite pasta dish. The "secret" she says is add a little pasta water with the raw eggs. I've read that this used to be peasant food until WWII. When the allies took Rome, the available supplies were largely bacon and powdered eggs. This lead to Carbonara to be a popular culinary dish. Good food is good food. I don't care if it Roman beans and sauerkraut or Kobe beef and a lobster or anywhere in-between. All of Gennaro's video's are great. He cooks with a high level of enthusiasm. Most of his dishes are 4 or 5 ingredients and 30 minutes or so to cook. This weekend I'm going to try making his Chicken ragu bianco.